I recently got invited to go & talk to a SAS shop, a big one! This has not happened for a while (to me), well it wouldn't, would it? These (recent) days I (have been) a confirmed R man1, maybe a wee bit of S+ but R; Revolution R2 if possible but R; Hadoop3 4yes, Netezza5 6, yes & the deliriously beautiful SAP HANA7 but for me it has to be R, well that's the way I have attitudinised8 it here on asymptotix!! The present writer took up his Eurostat post in March 1991, right after Desert Shield. He was told then that Eurostat "had no right" to publish economic analyses and those instructions were repeated from time to time ever since. No Eurostat publication that he has seen contained any fruits of the officially forbidden research. GDP increased by 0.2% in both the euro area (EA17) and the EU27 during the third quarter of 2011, compared with the previous quarter, according to flash estimates published by Eurostat, the statistical office of the European Union. In the second quarter of 2011, growth rates were +0.2% in both zones. Compared with the same quarter of the previous year, seasonally adjusted GDP increased by 1.4% in both zones in the third quarter of 2011, after +1.6% in the euro area and +1.7% in the EU27 in the previous quarter. Five US banks have released some data (SEC filings) of their exposure to PIIGS. Lenders increased overnight deposits at the European Central Bank to the highest level in more than 16 months. Banks parked 299 billion euros ($412 billion) with the Frankfurt-based ECB yesterday, up from 288 billion euros on Nov. 4. That’s the most since June 30, 2010, and compares with a year-to-date average of 71 billion euros. “Europe is probably going to fall into recession in the fourth quarter,” said Holger Schmieding, chief economist at Joh. Berenberg Gossler & Co. in London. “Leading indicators are pointing to a modest recession,” and the European Central Bank “will probably go to a softer stance soon,” Schmieding said in a radio interview on “Bloomberg Surveillance” with Ken Prewitt and Tom Keene. 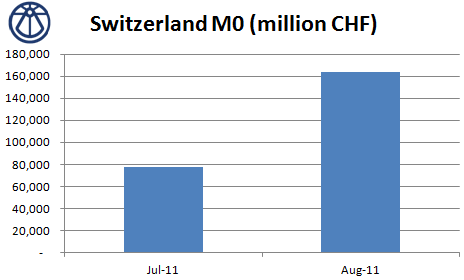 While M0 increased from 77.2 bn CHF to 163.4 bn CHF, M1 increased from 442 bn CHF to 464, M2 from 689 bn CHF to 713 bn CHF and M3 increased from 748 bn CHF in July to 762 bn CHF in August.